A cat door could be the answer if you are fed up with being disturbed every time your kitty wishes to come in or go out! Or maybe you want your cat to be able to come and go as they like, but without stray animals being able to get into your home? Then it could be time to buy a pet door! But before you do, there are a few things you should consider to make sure you get the right one. What type would suit your kitty the best? 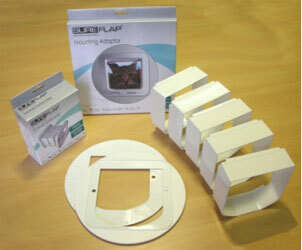 Where will you place your cat flap? These days most animal doors are lockable so you can keep your cat in when you want to. But you often see descriptions such as "four-way lockable", but what does that mean? A problem many kitty owners have with some cat flaps is that other felines or stray animals can also get into your home! One way to deal with this problem is to buy a door that only lets your own animals in or out. This can be achieved using an electromagnetically operated door. Your cat has to wear a special magnetic tag on their collar which releases the lock whenever they approach the door. An example of this kind is made by Cat Mate which you can see in the picture. The door runs on batteries and has the benefit of four-way locking as well. 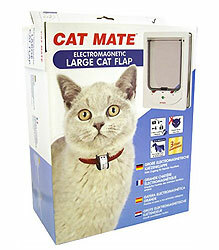 Of course, this type can be a great solution, but only if your feline friend is used to wearing collars! My two boys Byron and Shelley keep wriggling out of their collars no matter what I do! Another problem might be if the tag comes off the collar while your kitty is out and about, so you then have to buy a replacement. But if your kitty is happy keeping their collar on all the time, then this could be the one for you! Getting your cat's micro-chipped is one of the best things you can do to help ensure they are returned home if they ever get lost. For more information, see my other page all about micro-chipping. You can now get cat flaps that use your pet's existing microchip to operate the lock in a similar way to the magnetic type above. The benefit of the microchip variety is that your kitty doesn't have to wear a collar and tag! 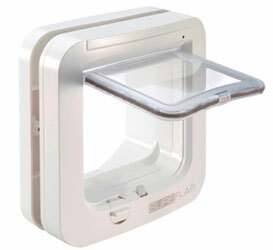 An example of a microchip pet door is made by SureFlap which you can see in the picture. Instead, this type of cat door recognises the identification number in your animal's microchip. How cool is that? You have to programme the door first so that it recognises your pets chip number but this is easy to do. The door has a 'learn' mode where it is open all the time. Set the door to learn mode and let your feline friend go through the door in their own time. Your kitty's microchip number is then automatically stored in the doors memory and it will recognise it next time they want to enter through the door. Job done! Simply repeat the process if you have multiple cats. Where Will You Place The Cat Door? In an interior or exterior door? In a glass panel of a door or window? Or in a hole cut through a brick wall? Many pet doors are suitable for all of these applications, but do check first. You may also need to buy some accessories. For instance, if the flap is going to be set into glass, you will probably need a special mounting adaptor (and a professional glazer to prepare the hole first). If the door is going to go through a brick wall, you will also need to buy an adaptor and some tunnel extenders to fit it through the thickness of the wall. Don't forget to check the size, especially if you have a large breed such as a Maine Coone. Cats can squeeze through some pretty tight spots, but the door you buy should be wide enough so your kitty can fit through quite comfortably. Otherwise they might be put off from using it and simply sit wailing and meowing until you come to open the door for them, which pretty much defeats the point! So take the time to do some research, look at all the varieties available and read up on the customer reviews to help you make your own best choice. 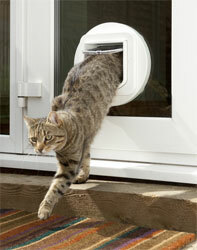 With a bit of thought and pre-planning, you can find the best cat door for your purposes. No more distractions of having to get up to let your pets in or out. Plus a newly independent and happy kitty as well!